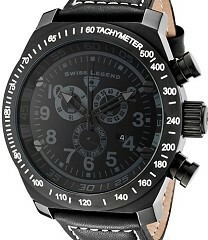 Swiss Legend SS SL Pilot Chronographs HUGE! Four available, Swiss quartz movement, Sapphitek crystal, SS, brown leather strap, double deployant buckle, chronograph functions with 30 minute, subsidiary day of the week and 60 second subdials; date window at 4, White dial with Black border, water resistant to 330 feet (100 M), 38mm x 52mm with lugs. Have Silver dial, Black dial & Copper tone dial, these 3 have Black leather straps. Black dial does not have deployant buckle! Retail was $895... Sell for $200 or Trade! We also have several Quartz Models available plus several dozen other Quartz Chronograph's & diver's. Please email for Free delivery pricing on these models... Challenger, Commander, Conqueror, Endurance, Evolution, Executive, Expedition, GMT Worldtimer, Heritate, Legato, Maverick, Monte Carlo, Neptune, Submersible, Scubador, SL Pilot, Throttle, Trimex, Traveller plus many others with 1 to 2 pieces. We can trade for luxury wristwatches, complicated pocket watches, PCGS USA Coins, Precious metals (GOLD, PLATINUM, SILVER) or many other luxury items! Please contact us with your trades & offers for an extremely fair & complete valuation!